Last weekend, what I gaily referred to as a Christmas Fair took place in the grounds of Chapala Sailing Club but, in truth, the ‘Maestros del Arte’ aptly describes the nature of this event. 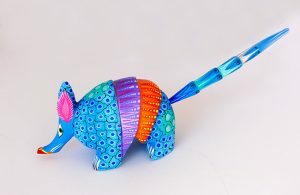 It’s a gathering of ‘masters’, from throughout Mexico, who are invited to showcase and sell their remarkable, and mostly one-of-a-kind arts/crafts. As it was our first visit, we spent Friday morning simply browsing – there was so much to see, and everything of the highest quality. 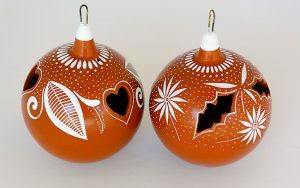 At the same time, we couldn’t avoid comparing the prices to past experiences of Christmas Fairs in BC and elsewhere, and marveled at the affordability of uniquely original items that would likely fetch hundreds, if not thousands of dollars north of the border. I also spent 200 pesos on a strip of raffle tickets that were being sold to benefit a local ‘Feed the Children’ charity. Lo and behold, on Saturday evening, the phone rang and we were summoned to collect a prize from the Feria on Sunday morning. All the prizes had, in fact, been donated by the individual stall holders – so whatever we’d won it was going to be a hand-crafted and unique work of art. And we weren’t disappointed – especially as it was an item for me, and something to wear. A Mexican ‘rebozo’ is equivalent to a pashmina – a shawl – and can be woven out of a variety of different fibres, although may are heavy silk. Interestingly, given that silk is mostly associated with the Far East, it was fascinating to discover that many Mexican villages with weaving traditions now raise their own silk worms ­– both wild and cultivated. Even more interesting is the fact that silk can only be gathered twice a year and 20,000 silk worms are required to produce 10 kilos of cocoons – sufficient to make only four or five large rebozos. (I have to acknowledge our local English magazine, El Ojo del Lago (The Eye of the Lake), that published an article entitled ‘The Story Behind the Art’ from which I was able to gather this information.) 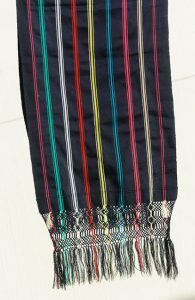 The photo below is of the rebozo won in the raffle. Of course, I didn’t know any of this before we collected our raffle prize, but it was important to me to meet and personally thank the artist who had donated the rebozo. As it happened, I learned that Cecilia Bautista Caballero holds a special honour in Mexico for being one of only four distinguished ‘master’ weavers. Born in 1939, Cecilia is a proud descendant of the indigenous Purépech people from Ahuiran, in the state of Michoacán (bordering the southern shore of Lake Chapala). Her village lies on the Tarascan plateau near Uruapan. 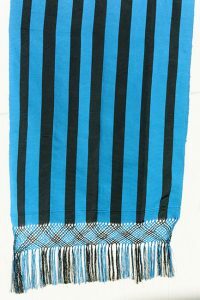 For generations, the women of this community have woven the classic indigo rebozos with black and light blue pin-stripes. 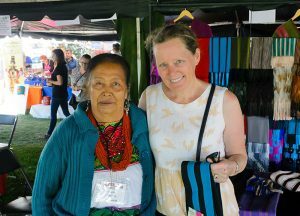 Cecilia learned the art of back-strap loom weaving*, or patakua in Purépech, and dyeing from her mother. Starting her apprenticeship at the age of eight, she learned all facets of the process, including the knotted fringes that have rayon silk added on, with various designs used as ceremonial shawls in Ahuiran and neighbouring Tarecuato. Cecila is also proud of the fact that she was the first weaver to experiment with placing real feathers in the fringes many years ago, an idea that came to her when she found out about feather work among the pre-Hispanic Purépech (or Tarascans). She has won many special awards for her weaving, including being honoured with a ‘Great Masters of Mexican Folk Art’ distinction. Today, her five daughters and son weave together, working on the fringes and introducing new innovations, such as placing glass beads in the knotted surface. Such is the warm-hearted generosity of the Mexican people we’ve encountered, so far, and she was also delighted to pose for a photograph, as you will see. Interestingly, where faults or snagged threads are considered to be unacceptable in store-bought items using automated processes, they provide living interest and visual delight by the very nature of the items being handmade from beginning to end, in conditions and using equipment that might, respectively, be considered primitive and crude. Certainly every items tells a story, from raising the silk worms and harvesting the cocoons, spinning and dyeing the silk, creating colours using natural dyes, weaving on the simplest of looms…. And, now, I have two of Cecilia’s rebozos that will be an eternal reminder that high-tech isn’t necessary to produce such fabulous fashion pieces. Interesting story how the shawls are made! Your descriptions of the beautiful shawls and how they are made reminded me of a market we visited on a day trip, by bus, up through a cloud forest to Calpulaipan. We were staying at the Hotel Mariposas in Oaxaca and at the Lending Library next door we chanced upon this trip which included a visit to a church where we attended a talk on its restoration. This was followed by a luncheon and entertainment. The people were so hospitable and friendly. Just before we had to get back on the bus we went through a market where I spotted an embroidered blouse, like others I’d seen, but unique. Wish I’d found out more about it and taken notes! So this is to say I appreciate your blog as your stories have depth and go into details that are easily forgotten. Are you house-hunting?